Here is a Silurian period cephalopod classified as Dawsonoceras annulatum. It looks like a small part of its shell is left (the pinkish looking rock with the sine wave shapes in it). The rest of the fossil is just an imprint on a rock. 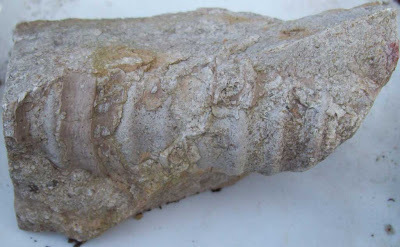 I found this specimen at KYANA fossil study and always like find this cephalopod fossil. More to come.